Examples, solutions, and lessons to help High School students learn how to represent complex numbers on the complex plane in rectangular and polar form (including real and imaginary numbers), and explain why the rectangular and polar forms of a given complex number represent the same number. I can represent a complex number in a complex plane. I can convert a complex number from rectangular (standard) form to polar (trigonometric) form. I can convert a complex number from polar form to rectangular form. 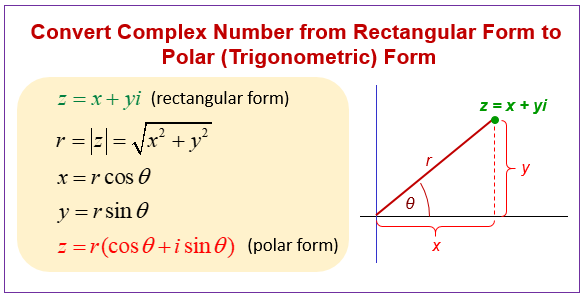 The following diagram shows how to convert complex numbers from rectangular form to polar (trigonometric) form. Scroll down the page for more examples and solutions. Represent a complex number in the complex plane. The complex plane, complex numbers in standard form, the difference between complex numbers and imaginary numbers, and plotting complex numbers in the complex plane. The complex plane; converting complex numbers between rectangular form and polar (trigonometric) form; the product and quotient formulas for complex numbers written in polar form. Expressing a Complex Number in Trigonometric or Polar Form, Ex 1. Step by step instruction in converting a complex number from its polar form to its rectangular equivalent. We take a number in polar form and write it in complex form.